Tatiana Wells, Cleveland Central Promise Neighborhood’s early learning navigator, received the 2018 Carolyn Grossman Award from Family Connections for her work with parents of early learners. Longtime Cleveland Heights kindergarten teacher Carolyn Grossman recognized that parents can make an enormous difference in their child’s ability to learn and grow, but need support in preparing their young children to learn in school. Family Connections has worked with the Grossman family to present the award for the last 15 years. On Friday, September 28, Tatiana was honored with her award at Family Connections’ annual clambake. Tatiana shared the award with Natalie Friedl, director of MyCom P-16 in Slavic Village. In attendance at the gathering were Tatiana’s mother, Debbie Wells, SOCF president Susanna H. Krey, Vet Nixon, program specialist for Out of School Time, and Keesha Tolliver-Funches, Family Connections’ SPARK parent partner. 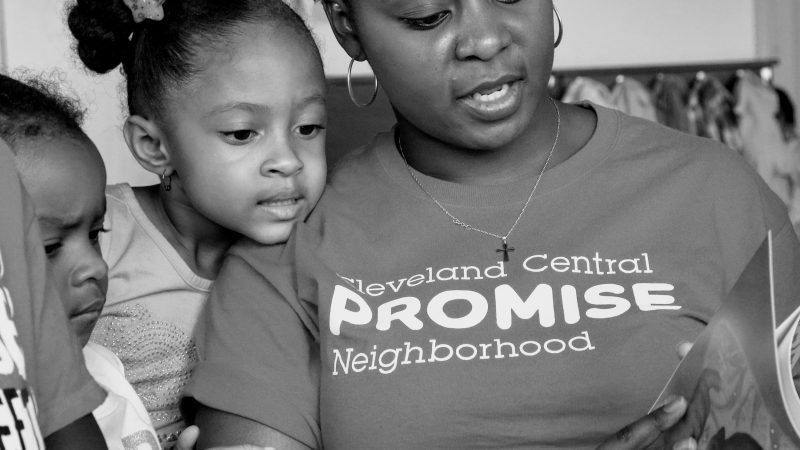 Tatiana joined Promise as a full-time employee in 2014 as Starting Point’s early learning navigator for the Cleveland Central Promise Neighborhood. Her role involves helping families find access to the best early learning options in Central, as well as offering opportunities for those early learning centers to become stronger and reach high-quality levels. Recognizing that a parent is the child’s first teacher, Tatiana is focused on connecting with parents through the neighborhood. She conducts door-to-door canvassing ahead of the school year to speak with parents and ensure they have the tools they need to support their child’s education. Tatiana presents them with an early learning guide and talks through their options, and she also works to connect them with additional support services, like utilities, community outreach and housing support. With Tatiana’s influence, over the last 10 years the number of early learning centers with quality ratings in Central has increased from two to 13 – nine of which are rated for high quality. Since she started her work with Promise, she has convened all directors of Central’s early learning centers into a Directors’ Network, which meets quarterly to share best practices and discuss trends observed among parents and families. From these meetings, centers have been more focused on strengthening their quality ratings, and directors are made aware of available trainings to help staff deal with challenges like student trauma, domestic violence or teacher burnout. Family Connections president Joanne Federman said she was proud to present Tatiana with the Carolyn Grossman Award.